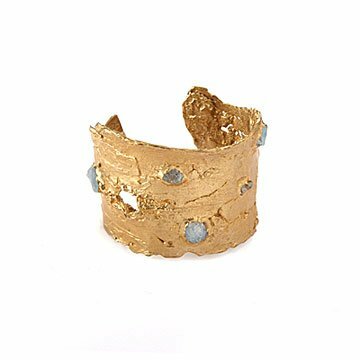 Inspired by Maui’s painted forest, Emilie Shapiro’s bold cuff reminds us of nature’s beauty, near and far. On the island of Maui, Hawaii, within dense rainforest bustling with life, rainbow eucalyptus trees shine in vibrate oranges, blues, and greens. Awed by her experience visiting this magical "painted forest," Emilie Shapiro created a bold cuff inspired by the enormous, colorful trees. Respectfully leaving the gorgeous bark of the eucalyptus in the painted forest, Emilie instead replicated its texture using a mold of a piece of birch in her Queens, New York, studio. Each handmade piece is cast by placing radiant aquamarine emerald gems in her mold and then letting molten nickel-free, recycled brass form around the stones. Wear it as a reminder that nature's beauty is all around us, from vast forests in remote places to the trees in our own hometowns. Handmade in New York City.